U.S. Sen. Shelley Moore Capito, R-W.Va. talks with Tom Crabtree, one of the founders of The West Virginia Great Barrel Company in Harts Run Monday. 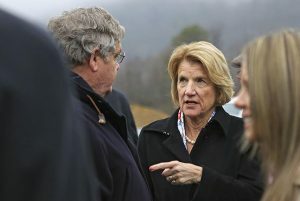 Capito attended an event at the construction site of the West Virginia Barrel Company to announce a $1.536 million award to the town of White Sulphur Springs from the U.S. Economic Development Administration to extend water service to the new industrial park that will house the West Virginia Great Barrel Company. WHITE SULPHUR SPRINGS, W.Va. — Speaking at an event in her home state on Monday, U.S. Sen. Shelley Moore Capito, R-W.Va., contradicted gloomy national news reports about chances for yet another government shutdown. Capito is chair of the Senate Homeland Security Appropriations Subcommittee and a member of the Senate-House conference committee now striving to find a workable compromise on the issue of funding for the wall. Lack of such a compromise forced a five-week shutdown that concluded Jan. 25, when negotiations resumed, but only until Feb. 15 — this Friday.